1 shot Sign Paint-Amazing Paint Lettering Enamels Hand Lettering and Pin-striping paints is the worlds favorite. 1 shot has operated since 1948 (1shot for sale at bottom of this page). Alkyd-Resin 1 shot (oil base) gloss enamels for interior or exterior use on metal, glass, wood, enamel receptive banners and vinyl, vehicle lettering, pinstriping and graphics. 1 Shot Lettering Enamels have outstanding hiding, durability and fade resistance. 1 shot has superior flow characteristics assure the virtual absence of brush marks and provide a clean, sharp edge. 1 shot Limitations: Best applied between 65 F and 85F. Will not dry below 50 F.
1 shot Application Method: Brush, Roller, Airbrush or Spray. 1 shot Thinning: 1 Shot ZZ6000 Series Reducers as needed. 1 shot Compatibility: 4001/4002 Tints., 4003 Clear, 4007 Hardener. 1 shot Cleanup: Brushes: 4004 Brush Cleaner. Equipment: Mineral spirits. Designed as tinting agents for use with 1 Shot Lettering Enamels and Chromatic Bulletin Colors. 4001 Tinting Black darken colors without muddying. 4002 Tinting White lightens colors without washing them out. Both can be used with 1 Shot black or whites to create a variety of gray values.Designed as tinting agents for use with 1 Shot Lettering Enamels and Chromatic Bulletin Colors. 4001 Tinting Black darken colors without muddying. 4002 Tinting White lightens colors without washing them out. Both can be used with 1 Shot black or whites to create a variety of gray values. 1 shot Limitations:Not intended as a top coat. Use only with Lettering Enamels or Bulletins. 1 shot Thinning:1 Shot ZZ6000 Series Reducers as needed. 1 shot Compatibility:1 Shot Lettering Enamels, 1 Shot 4003 Clear, Chromatic Bulletin Colors. 1 shot Cleanup:Brushes:4004 Brush Cleaner. Equipment: Mineral spirits. Single component, fast-drying high gloss enamels for sign backgrounds where expedient drying is desired over metal, wood, some plastics and H.D.U.. Usually dry to the touch in 2 hours. Available in 101 White. 1 shot Limitations:Best applied between 65 F and 85F. Will not dry below 50 F.
1 shot Cleanup:Brushes: 4004 Brush Cleaner. Equipment: Mineral spirits. Alkyd-Resin (oil base) gloss enamels for interior or short term exterior use on wood, metal or masonry. Excellent limited exterior durability with very good hiding and gloss finish. Formulated to provide easy application with large brushes. Ideal for billboards or short term exterior signs as well as interior murals. Limitations:Best applied between 65 F and 85F. Will not dry below 50 F.
Thinning:1 Shot ZZ6000 Series Reducers as needed. Compatibility:All other Bulletin Colors except B021 Black. 4001/4002 Tinting Colors. 1 shot Compatability:1 Shot Lettering Enamels, 1 Shot 4003 Clear. 1 shot Cleanup:Brushes: 4004 Brush Cleaner. Alkyd-Resin (oil base) fast drying, flat-finish enamels for interior use on paper, card stocks, muslin, stretched canvas, wood, metal or glass. 1 Shot Art and Sign Poster Colors seal porous surfaces, will not wrinkle paper or card stock and because of their nearly dead-flat finish, diminish glare, making them ideal for set decoration and interior wall murals and artwork. Thinning:1 Shot ZZ6001 Low Temp or ZZ6002 High Temp Reducers. Compatibility:All colors are inter-mixable except 3099 Black. Fluorescent Lettering paints are Semi-transparent, high intensity UV reactive oil based flat finish paints with sparkling color clarity. Interior and very short-term exterior projects only, 1 Shot Fluorescent Colors should be applied over a white background for optimum intensity. Prone to showing brush marks and overlaps, 1 Shot Fluorescent Colors should be sprayed, rolled, screen printed or applied in a single stroke fashion. This Product is one of the few remaining "Oil Based Fluorescent Colors" and is superior to water based Fluorescent Colors of Sign Paint. Thinning:1 Shot ZZ6001 Low Temp Reducer. Compatibility:Some inter-mix-ability, though not generally recommended. An exceptional self-leveling and fast setting size for use in gilding. Designed to retain elasticity, engine turning and burnishing can usually be accomplished up to five hours after gilding. 1 Shot Fast Dry Gold Size generally allows the application of 22 and 23 karat gold leaf within an hour, and less precious and heavier metal leaf products sooner. Thinning:up to 10% 1 Shot ZZ6000 Chroma-Flo to retard drying or extend window. Compatibility:Use 1 Shot 4003 Clear to protect surface gilds after two hours. Whatever you need to paint, 1 Shot or Chromatic primer for you! The foundation of any quality paint project, proper priming and surface preparation are the first step in achieving optimum results...and with eight primers and block outs to choose from; we've got you covered. A waterborne high performance modified acrylic primer suitable for use on wood, metal, HDU and most masonry applications. Offering excellent adhesion qualities, WP1008 Primer is easy to apply, easy to sand and dries fast enough that you'll be painting in three hours. Limitations: Do not apply in temperatures below 55F or when humidity is above80% Application Method: Brush, Roller or Spray Thinning: No more than 15% reduction with distilled water for spray applications. Compatibility: All 1 Shot Background and Lettering Enamels.. Cleanup: Warm, soapy water before primer dries. A high opacity, solvent based primer with exceptional adhesion qualities over both wood and metal surfaces. Limitations: Allow 8-12 hours before painting. Application Method: Brush, Roller or Spray Thinning: Not required. For spray applications, use mineral spirits sparingly. Compatability: All 1 Shot Background and Lettering Enamels. Cleanup: Brushes: 4004 Brush Cleaner. Equipment: mineral spirits. HIGH BUILD WHITE PRIMER #4411010 A high viscosity waterborne primer with excellent filling and building characteristics. Ideally suited for HDU, most woods and foam. High Build White Primer exhibits high coverage and opacity characteristics and can be easily sanded smooth, and is formulated to accept both oil and waterborne topcoats. Limitations: Prevent from freezing. Application Method: Synthetic brush, roller or spray Thinning: Up to 10% distilled water for spray application, only if absolutely needed. Compatability: All 1 Shot Enamels, and many acrylic or waterborne paints. Cleanup: Warm, soapy water. VINYL PRIMER #5004 A clear, water based primer for vinyl and most rigid synthetic surfaces including expanded PVC, corrugated styrene, ABS plastics and most PVC vinyl film products. 5004 Vinyl Primer creates a barrier against plasticizer migration, making surfaces suitable for finishing with 1 Shot Background and Lettering Enamels, Chromatic Bulletin Colors and even Fluorescent and Art & Sign Poster Colors. While milky when applied, 5004 Vinyl Primer dries clear, and is generally ready to accept 1 Shot paint products in 30-40 minutes. Limitations: Use only brushes previously used with water based products. Application Method: Brush, Roller, Rag or Spray. Thinning: Not recommended. Compatibility: 1 Shot Background and Lettering Enamels, Bulletin Colors. Cleanup: Warm, soapy water. 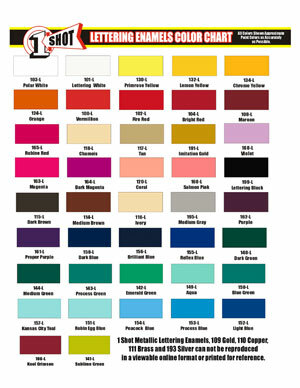 TI-COTE CLEAR PRIMER BARRIER A waterborne primer/barrier intended for use on most flexible synthetic fabrics including untreated (non-ERC) banner materials, canvas, leather, leatherette, Naugahyde and most synthetic awning fabrics. Available in both Gloss (4331010) and Flat (4331011) finishes, Ti-Cote makes prepares these otherwise non-enamel receptive surfaces ready to paint. Ti-Cote is milky white when applied, but dries clear and is generally ready to paint in 1-2 hours. Limitations: Always test for clear drying, especially on dark colored materials.. Application Method: Synthetic brush, Roller, Rag or Spray. Thinning: Not recommended. Compatibility: 1 Shot Background and Lettering Enamels Cleanup: Warm, soapy water. PBOW Fast Dry Block out White #4420101 A fast drying, high opacity coating designed for use in blocking out previously painted sign faces, PBOW can also be used as a primer on new MDO sign faces and is easily sanded. Popular in high,and rapid production environments due to its fast drying times, generally drying to a dead flat finish in about 2 hours. Limitations: Prevent from freezing. Application Method: Brush, Roller or Spray. Thinning: For spray applications, use 1 Shot ZZ6002 Reducer sparingly. Compatibility: 1 Shot Background and Lettering Enamels Cleanup: Brush: 4004 Brush Cleaner. Equipment: Mineral spirits. PBOW602 Block Out White #4420602 A high viscosity block out white, higher in pigmentation than PBOW Block Out White, allowing for virtually complete coverage and opacity over previously painted signs. Limitations: Prevent from freezing. Application Method: Brush, Roller or Spray. Thinning: For spray applications, use 1 Shot ZZ6002 Reducer sparingly. Compatibility: 1 Shot Background and Lettering Enamels Cleanup: Brush: 4004 Brush Cleaner. Equipment: Mineral spirits. As important as using 1 Shot Lettering Enamels, the finest sign and graphic paint products available; it's equally important to use our full line of reducers and additives, engineered specifically for complete compatibility. Chromaflo ZZ6000 Flow Enhancer for Pinstriper's and Sign Painter's ChromaFlo is designed to act as a flow enhancing additive for use with brush applications of 1 Shot Lettering Enamels and Chromatic Bulletin Colors. Not to be mistaken as a reducer, ChromaFlo, when used sparingly, will increase brush control, decrease brush drag and enhance flow and leveling characteristic; especially suitable for lettering and pinstriping applications. Limitations: Should not be used in airbrush or spray applications Application Method: Palette in, using sparingly. Thinning: N/A Compatibility: 1 Shot Lettering Enamels, Bulletin Colors, Pearlescent Colors Cleanup: Brushes:4004 Brush Cleaner. Oneshot's Low Temp Reducer ZZ6001 for when it's "Cold Out" Formulated to improve flow and leveling at low temperatures by reducing viscosity and accelerating the evaporation process without significantly reducing the quality of the coating. ZZ6001 Low Temp Reducer is ideal for spray and airbrush applications, as it exhibits superior atomization. Limitations: Use only enough for effective application. Do not over reduce. Application Method: Brush: Pallette in, using sparingly. Spray: Premix thoroughly Thinning: N/A Compatibility: 1 Shot Lettering Enamels, Bulletin Colors, Pearlescent Colors Cleanup: Brushes:4004 Brush Cleaner. Oneshot's High Temp Reducer ZZ6002 for when it's "Hot Out" Formulated to improve flow and leveling at high temperatures by reducing viscosity and retarding the evaporation process without significantly reducing the quality of the coating. ZZ6002 High Temp Reducer is ideal for lettering, graphics and pinstriping applications. Limitations: Use only enough for effective application. Do not over reduce. Application Method: Brush: Pallette in, using sparingly. Thinning: N/A Compatibility: 1 Shot Lettering Enamels, Bulletin Colors, Pearlescent Colors Cleanup: Brushes:4004 Brush Cleaner. Oneshot's Hardener 4007 added for strength, chemical resitance and durability Designed to accelerate drying time for all 1 Shot Background, Lettering and Pearlescent Enamels as well as Chromatic Bulletins. 1 Shot Hardener can, in many cases improve adhesion qualities as well as extend color life and increase gloss retention. 4007 Hardener is also required in anticipation of using any enamel or urethane topcoats over catalyzed 1 Shot. Limitations: Limit saturation to 10%, with 5% being sufficient for non-clearcoated jobs. Application Method: Brush: Pallette in, using sparingly. Thinning: If required, use only 1 Shot 6001 Low Temp Reducer Compatibility: 1 Shot Lettering Enamels, Bulletin Colors, Pearlescent Colors, 4003 Clear Cleanup: Brushes:Clean promptly with 4004 Brush Cleaner. Oneshot's Flattening Paste-Clear 4329500 Mixing with 1 Shot Lettering Enamels or Chromatic Bulletins, Clear Flattening Paste will modify gloss levels for both interior and exterior use. A 1:1 mix ratio will rersult in a nearly dead flat finish, with lesser amounts yielding varying degrees of gloss ranging from semi-gloss to eggshell Limitations: Limit saturation to 50%. More than 20% can effect opacity.. Application Method: Premix thoroughly. Thinning: If required, use only 1 Shot Reducer Compatibility: 1 Shot Lettering Enamels, Bulletin Colors, Pearlescent Colors, 4003 Clear Cleanup: Brushes: 4004 Brush Cleaner. Oneshot's Brush Cleaner Conditioner 4004 for Lettering and Pinstriping Brushes A premium brush cleaner designed to not only thoroughly clean oil based paints from quality, natural hair brushes, but to do so without damaging the hair of the brush. Unlike harsh spirits and reducers, 1 Shot Brush Cleaner and Conditioner conditions,and softens the brush and can even be used to restore partially hardened natural and nylon brushes; all without interfering with the properties of oil based sign paints. Limitations: Limit saturation to 50%. More than 20% can effect opacity.. Application Method: Premix thoroughly. Thinning: If required, use only 1 Shot Reducer Compatibility: 1 Shot Lettering Enamels, Bulletin Colors, Pearlescent Colors, 4003 Clear Cleanup: Brushes: 4004 Brush Cleaner. Ten different clear topcoat products, 1 Shot and Chromatic Clears surely have a clear topcoat for your application. Oil based Enamels, Acrylics, Urethane and even Waterborne clears mean that choosing 1 Shot is clearly your best option. 1 Shot's Clear Coat 4003 for Lettering, Gold-Leaf and Pinstripe Graphics Oil based clear finish, 1 Shot 4003 Clear is essentially a clear lettering enamel; and is ideal for use in top coating surface gilds and as a vehicle in which to suspend other 1 Shot products to create translucent and transparent glazes, washes and shading mediums. 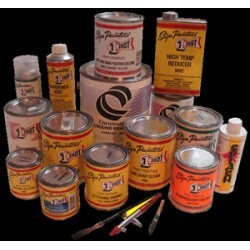 This product may also be used to restore gloss level on older signs originally painted with 1 Shot. Limitations: Best applied between 65 F and 85F. Will not dry below 50 F. Application Method: Brush, Roller, Airbrush or Spray Thinning:1 Shot ZZ6000 Series Reducers as needed. Compatibility: 1 Shot Lettering and Pearlescent Enamels, 4001/4002 Tints.. Cleanup: Brushes: 4004 Brush Cleaner. Equipment: Mineral spirits. Oneshot's "GraphiGuard" Eco-Sol for U.V. Top-Coat Protection With An These UV Resistant Waterborne Clears offer moderate mar resistance and excellent UV protection both for themselves as well as the surface coatings they cover. GraphiGuard Clears are an exceptional choice as a protective topcoat for UV Ink, Solvent, Eco-Sol and Thermal Resin Transfer Print projects. Available in Gloss GraphiGuard Clear #4331020 and Matte GraphiGuard Clear #4331030# finishes. Limitations: Allow 12 hours curing time (minimum) of prints before clearing. Application Method: Brush, Roller or Spray Thinning: Reduce with up to 10% distilled water for spray applications. Compatibility: Fully dry and cured digital prints. Cleanup: Warm, soapy water. Fluoresent U.V. 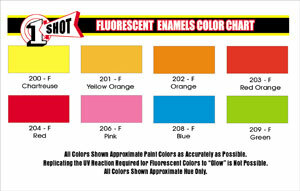 Clear Coat 220F-Extends Fluorescent lettering enamels life. Specifically designed as a topcoat for 1 Shot oil-based fluorescent colors only, 220F offers some extension to the life of 1 Shot Fluorescent Colors by increasing protection against ultraviolet light. Limitations: Use only over 1 Shot Fluorescent Colors. Do not use over vinyl or prints. Application Method: Brush, Roller or Spray. Thinning: Normally not required. If needed, use ZZ6001 Low Temp Reducer sparingly. Compatability: 1 Shot Fluorescent Colors. Cleanup: Clean brushes with 1 Shot 4004 Brush Cleaner. Oneshot Speed Dry U.V. Acrylic Clear Coat - for printed signage Dry UV Acrylic Clears also serve well as edge sealers on multi-layered vinyls, PVc, PVF and metalized polyester films. Subject to re-wetting in extreme heat or when contacted with certain cleaning chemicals, Speed Dry UV Acrylic Clears are not recommended for use on vehicle graphics. Available in Gloss (4005) and Matte (4015) Limitations: Extreme or prolonged heat and certain chemicals can result in rewetting. Application Method: Brush, Roller or Spray. Do not overwork, as this will cause "stringing". Thinning: Not required or suggested.. Compatibility: Non-vehicle digital print applications.. Cleanup: Brushes: 1 Shot 4004 Brush Cleaner. Equipment: Mineral spirits. A fast drying acrylic clear topcoat designed for providing color fade, UV depletion and mild abrasion resistance on printed vinyls and print media. Speed Formulated as an application fluid concentrate, designed to aid in the application of pressure sensitive vinyl films and graphics; allowing for re-positioning and the removal of trapped air by acting as a buffer between the adhesive and the surface until such time it is squeegeed out from beneath the film or graphic. Limitations: Prevent from freezing. Application Method: Pre mix one-8 oz. container with 120 ounces of water. Thinning: N/A Compatibility: With any vinyl or polyester films that allow for wet application. Cleanup: soap and water. ALWAYS READ AND UNDERSTAND THE MATERIAL SAFETY DATA SHEET (MSDS) AND LABEL PRODUCT WARNING PRIOR TO HANDLING OR USING THESE PRODUCTS. While the descriptions, data and information contained herein are presented in good faith and believed to be accurate, they are provided for your guidance only. Because many factors may affect processing, application or use, we recommend that you perform an assessment to determine the suitability of a product for your particular purpose prior to use. No warranties of any kind, either expressed or implied, including fitness for a particular purpose, are made regarding products described, data or information set forth. In no case shall the descriptions, information or data provided be considered a part of our terms and conditions of sale. Further, the descriptions, data and information furnished here are given gratis. No obligations nor liabilities for the description, data and information given are assumed. All such being given and accepted at your risk. For Professional Commercial, Industrial and Graphic Artists use only. Always Perform Test on Products before selling commercially, to know your products best. 1 shots most current product listing and status for the 1-Shot sign paints. Please note that this listing will be updated regularly during the integration process. This does not reflect current inventory. 1 Shot Lettering Anti-Graffiti Clear- Part B 4020 - Pint Anti-Graffiti Clear- Part B 4020 - pint size Alkyd-Resin (oil base) gloss enamels ..
1 Shot Lettering Anti-Graffiti Clear Gloss- Part A 4016-Quart Anti-Graffiti Clear Gloss- Part A 4016 - Quart Size Alkyd-Resin (oil bas..
1 Shot art poster colors chrome yellow ZZ3002 quart1 Shot art poster colors chrome yellow ZZ3002 quart where to buy online. Oil based art poster colo..
1 shot art poster colors paint black ZZ30991 shot art poster colors paint black ZZ3099 quart, where to buy online. Oil based art poster colors in a th..
1 Shot Art Poster Colors Paint Blue Green ZZ30101 shot art poster colors paint blue green ZZ3010 quart, where to buy online. Oil based art poster..
1 Shot Art Poster Colors Paint Bright Red ZZ30051 shot art poster colors paint bright red ZZ3005 quart where to buy online. Oil based art poster ..
1 Shot Art Poster Colors Paint Brown ZZ30141 shot art poster colors paint brown ZZ3014 quart, where to buy online. Oil based art poster col..
1 shot art poster colors paint dark blue ZZ3008 quart1 shot art poster colors paint dark blue ZZ3008 quart, where to buy online. Oil based art poster ..
1 Shot art poster colors Paint Light Blue ZZ3009 1 shot art poster colors paint light blue ZZ3009 quart, where to buy online. Oil based art poste..
1 Shot Brush Cleaner 4004 Quart1 Shot brush cleaner 4004 quart. Buy it here. Brush Cleaner 4004 is great for cleaning out and conditioning your brushe..
1 Shot Chromo Flow/Reducer ZZ6000 - Quart Chromo Flow/Reducer ZZ6000 - Quart Size Alkyd-Resin (oil base) gloss enamels for interi..
1 Shot High Temp Reducer ZZ6002 - Quart High Temp Reducer ZZ6002 - Quart Size Alkyd-Resin (oil base) gloss enamels for interior or ext..
1 Shot Lettering Anti-Graffiti Clear Matte- Part A 4018- Quart Anti-Graffiti Clear Matte- Part A 4018 - Quart Size Alkyd-Resin (oil ba..
1 Shot Lettering Enamel Paint Aqua 149L - 1/2 Pint Aqua 149L - 1/2 Pint Size Alkyd-Resin (oil base)..
1 Shot Lettering Enamel Paint Aqua 149L - Pint Aqua 149L - Pint Size Alkyd-Resin (oil base) gloss enamels for..
1 Shot Lettering Enamel Paint Aqua 149L - Quart Aqua 149L - Quart Size Alkyd-Resin (oil base) gloss enamels for interior or ..
1 Shot Lettering Enamel Paint Block Out White 197B - Quart Block Out White 197B - Quart Size Alkyd-Resin (oil base) gloss en..
1 Shot Lettering Enamel Paint Blue Green 150L - 1/2 Pint Blue Green 150L - 1/2 Pint Size Alkyd-Resi..
1 Shot Lettering Enamel Paint Blue Green 150L - Pint Blue Green 150L - Pint Size Alkyd-Resin (oil base) gloss..
1 Shot Lettering Enamel Paint Blue Green 150L - Quart Blue Green 150L - Quart Size Alkyd-Resin (oil base) gloss enamels for ..
1 Shot Lettering Enamel Paint Bright Red 104L -Pint Bright Red 104L - Pint Size Alkyd-Resin (oil base) gloss ename..
1 Shot Lettering Enamel Paint Bright Red 104L - Quart Bright Red 104L - Quart Size Alkyd-Resin (oil base) gloss enamels for ..
1 Shot Lettering Enamel Paint Brilliant Blue 156L - 1/2 Pint Brilliant Blue 156L- 1/2 Pint Size Alkyd-Re..
1 Shot Lettering Enamel Paint Brilliant Blue 156L - Pint Brilliant Blue 156L- Pint Size Alkyd-Resin (oil base) glo..
1 Shot Lettering Enamel Paint Brilliant Blue 156L - Quart Brilliant Blue 156L- Quart Size Alkyd-Resin (oil base) gloss enamels fo..
1 Shot Lettering Enamel Paint Chamois 118L - 1/2 Pint Chamois 118L - 1/2 Pint Size Alkyd-Resin (oil..
1 Shot Lettering Enamel Paint Chamois 118L - Pint Chamois 118L - Pint Size Alkyd-Resin (oil base) gloss ename..
1 Shot Lettering Enamel Paint Chamois 118L - Quart Chamois 118L - Quart Size Alkyd-Resin (oil base) gloss enamels for interi..
1 Shot Lettering Enamel PaintChartreuse 200F - Quart Chartreuse 200F - Quart Size Alkyd-Resin (oil base) gloss enamels for interi..
1 Shot Lettering Enamel Paint Chrome Yellow 134L - 1/2 Pint Chrome Yellow 134L - 1/2 Pint Size Alky..
1 Shot Lettering Enamel Paint Chrome Yellow 134L - Pint Chrome Yellow 134L - Pint Size Alkyd-Resin (oil base)..
1 Shot Lettering Enamel Paint Chrome Yellow 134L - Quart Chrome Yellow 134L - Quart Size Alkyd-Resin (oil base) gloss enamel..
1 Shot Lettering Enamel Paint Coral 120L - 1/2 Pint Coral 120L - 1/2 Pint Size Alkyd-Resin (oil bas..
1 Shot Lettering Enamel Paint Coral 120L - Pint Coral 120L - Pint Size Alkyd-Resin (oil base) gloss enamels f..
1 Shot Lettering Enamel Paint Coral 120L - Quart Coral 120L - Quart Size Alkyd-Resin (oil base) gloss enamels for interior o..
1 Shot Lettering Enamel Paint Dark Blue 158L - 1/2 Pint Dark Blue 158L - 1/2 Pint Size Alkyd-Resin ..
1 Shot Lettering Enamel Paint Dark Blue 158L - Pint Dark Blue 158L - Pint Size Alkyd-Resin (oil base) gloss e..
1 Shot Lettering Enamel Paint Dark Blue 158L - Quart Dark Blue 158L - Quart Size Alkyd-Resin (oil base) gloss enamels for in..
1 Shot Lettering Enamel Paint Dark Brown 115L - 1/2 Pint Dark Brown 115L- 1/2 Pint Size Alkyd-Resin (oil base) glo..
1 Shot Lettering Enamel Paint Dark Brown 115L - Pint Dark Brown 115L- Pint Size Alkyd-Resin (oil base) gloss enamels for int..
1 Shot Lettering Enamel Paint Dark Brown 115L - Quart Dark Brown 115L- Quart Size Alkyd-Resin (oil base) gloss enamels for interior or exterior ..
1 Shot Lettering Enamel Paint Dark Green 148L - 1/2 Pint Dark Green 148L - 1/2 Pint Size Alkyd-Resi..
1 Shot Lettering Enamel Paint Dark Green 148L - Pint Dark Green 148L - Pint Size Alkyd-Resin (oil base) gloss..
1 Shot Lettering Enamel Paint Dark Green 148L - QuartDark Green 148L - Quart Size Alkyd-Resin (oil base) gloss enamels for interi..
1 Shot Lettering Enamel Paint Dark Magenta 164L - 1/2 Pint Dark Magenta 164L - 1/2 Pint- Size Alkyd..
1 Shot Lettering Enamel Paint Dark Magenta 164L - Pint Dark Magenta 164L - Pint- Size Alkyd-Resin (oil base) ..
1 Shot Lettering Enamel Paint Dark Magenta 164L - Quart Dark Magenta 164L - Quart Size Alkyd-Resin (oil base) gloss enamels ..
1 Shot Lettering Enamel Paint Emerald Green 142L - 1/2 Pint Emerald Green 142L - 1/2 Pint Size Alkyd-Res..
1 Shot Lettering Enamel Paint Emerald Green 142L - Pint Emerald Green 142L - Pint Size Alkyd-Resin (oil base) glos..
1 Shot Lettering Enamel Paint Emerald Green 142L - Quart Emerald Green 142L - Quart Size Alkyd-Resin (oil base) gloss enamels for..
1 Shot Lettering Enamel Paint Fire Red 102L - 1/2 Pint Fire Red 102L - 1/2 Pint Size Alkyd-Resin (o..
1 Shot Lettering Enamel Paint Fire Red 102L - Pint Fire Red 102L - Pint Size Alkyd-Resin (oil base) gloss ena..
1 Shot Lettering Enamel Paint Fire Red 102L - Quart Fire Red 102L - Quart Size Alkyd-Resin (oil base) gloss enamels for inte..
1 Shot Lettering Enamel Paint Fluorescent UV Topcoat Clear 220F - Quart Fluorescent UV Topcoat Clear 220F- Quart Size Alkyd-Resin..
1 Shot Lettering Enamel Paint Green 209F - Quart Green 209F - Quart Size Alkyd-Resin (oil base) gloss enamels for interior o..
1 Shot Lettering Enamel Paint Imitation Gold 191L - 1/2 Pint Imitation Gold 191L - 1/2 Pint Size Al..
1 Shot Lettering Enamel Paint Imitation Gold 191L - Pint Imitation Gold 191L - Pint Size Alkyd-Resin (oil bas..
1 Shot Lettering Enamel Paint Imitation Gold 191L - Quart Imitation Gold 191L - Quart Size Alkyd-Resin (oil base) gloss enam..
1 Shot Lettering Enamel Paint Ivory 116L - 1/4 Pint Ivory 116L - 1/4 Pint Size Alkyd-Resin (oil base) gloss enamel..
1 Shot Lettering Enamel Paint Ivory 116L - Pint Ivory 116L - Pint Size Alkyd-Resin (oil base) gloss enamels for interior or ..
1 Shot Lettering Enamel Paint Ivory 116L - Quart Ivory 116L - Quart Size Alkyd-Resin (oil base) gloss enamels for interior or exterior use on me..
1 Shot Lettering Enamel Paint Kansas City Teal 157L- 1/2 Pint Kansas City Teal 157L - 1/2 Pint Size Alky..
1 Shot Lettering Enamel Paint Kansas City Teal 157L- Pint Kansas City Teal 157L - Pint Size Alkyd-Resin (oil base)..
1 Shot Lettering Enamel Paint Kansas City Teal 157L- Quart Kansas City Teal 157L - Quart Size Alkyd-Resin (oil base) gloss enamel..
1 Shot Lettering Enamel Paint Kool Crimson 106L - 1/4 Pint Kool Crimson 106L - 1/4 Pint Size Alkyd-Resin..
1 Shot Lettering Enamel Paint Kool Crimson 106L - Pint Kool Crimson 106L - Pint Size Alkyd-Resin (oil base) ..
1 Shot Lettering Enamel Paint Kool Crimson 106L - Quart Kool Crimson 106L - Quart Size Alkyd-Resin (oil base) gloss enamels ..
1 Shot Lettering Enamel Paint Lemon Yellow 132L - 1/2 Pint Lemon Yellow 132L - 1/2 Pint Size Alkyd-..
1 Shot Lettering Enamel Paint Lemon Yellow 132L - Pint Lemon Yellow 132L - Pint Size Alkyd-Resin (oil base) g..
1 Shot Lettering Enamel Paint Lemon Yellow 132L - Quart Lemon Yellow 132L - Quart Size Alkyd-Resin (oil base) gloss enamels ..
1 Shot Lettering Enamel Paint Light Blue 152L - 1/2 Pint Light Blue 152L - 1/2 Pint Size Alkyd-Resi..
1 Shot Lettering Enamel Paint Light Blue 152L - Pint Light Blue 152L - Pint Size Alkyd-Resin (oil base) gloss..
1 Shot Lettering Enamel Paint Light Blue 152L - Quart Light Blue 152L - Quart Size Alkyd-Resin (oil base) gloss enamels for ..
1 Shot Lettering Enamel Paint Magenta 163L - 1/2 Pint Magenta 163L - 1/2 Pint Size Alkyd-Resin (oil..
1 Shot Lettering Enamel Paint Magenta 163L - Pint Magenta 163L - Pint Size Alkyd-Resin (oil base) gloss ename..
1 Shot Lettering Enamel Paint Magenta 163L - Quart Magenta 163L - Quart Size Alkyd-Resin (oil base) gloss enamels for interi..
1 Shot Lettering Enamel Paint Maroon 108L - 1/2 Pint Maroon 108L - 1/2 Pint Size Alkyd-Resin (oil b..
1 Shot Lettering Enamel Paint Maroon 108L - Pint Maroon 108L - Pint Size Alkyd-Resin (oil base) gloss enamels for ..
1 Shot Lettering Enamel Paint Maroon 108L - Quart Maroon 108L - Quart Size Alkyd-Resin (oil base) gloss enamels for interior..
1 Shot Lettering Enamel Paint Medium Brown 114L - 1/2 Pint Medium Brown 114L - 1/2 Pint Size Alkyd-..
1 Shot Lettering Enamel Paint Medium Brown 114L - Pint Medium Brown 114L - Pint Size Alkyd-Resin (oil base) g..
1 Shot Lettering Enamel Paint Medium Brown 114L - Quart Medium Brown 114L - Quart Size Alkyd-Resin (oil base) gloss enamels ..
1 Shot Lettering Enamel Paint Medium Gray 195L- 1/2 Pint Medium Gray 195L - 1/2 Pint Size Alkyd-Resin (o..
1 Shot Lettering Enamel Paint Medium Gray 195L- Pint Medium Gray 195L - Pint Size Alkyd-Resin (oil base) gloss ena..
1 Shot Lettering Enamel Paint Medium Gray 195L- Quart Medium Gray 195L - Quart Size Alkyd-Resin (oil base) gloss enamels for inte..
1 Shot Lettering Enamel Paint Medium Green 144L - 1/2 Pint Medium Green 144L - 1/2 Pint Size ..
1 Shot Lettering Enamel Paint Medium Green 144L - Pint Medium Green 144L - Pint Size Alkyd-Resin (oil base) g..
1 Shot Lettering Enamel Paint Medium Green 144L - Quart Medium Green 144L - Quart Size Alkyd-Resin (oil base) gloss enamels ..
1 Shot Lettering Enamel Paint Metallic Brass 111L - 1/2 Pint Metallic Brass 111L - 1/2 Pint Size Al..
1 Shot Lettering Enamel Paint Metallic Brass 111L - Pint Metallic Brass 111L - Pint Size Alkyd-Resin (oil bas..
1 Shot Lettering Enamel Paint Metallic Brass 111L - Quart Metallic Brass 111L - Quart Size Alkyd-Resin (oil base) gloss enam..
1 Shot Lettering Enamel Paint Metallic Copper 110L - 1/2 Pint Metallic Copper 110L - 1/2 Pint Size ..
1 Shot Lettering Enamel Paint Metallic Copper 110L - Pint Metallic Copper 110L - Pint Size Alkyd-Resin (oil b..
1 Shot Lettering Enamel Paint Metallic Copper 110L - Quart Metallic Copper 110L - Quart Size Alkyd-Resin (oil base) gloss en..
1 Shot Lettering Enamel Paint Metallic Gold 109L - 1/2 Pint Metallic Gold 109L - 1/2 Pint Size Alky..
1 Shot Lettering Enamel Paint Metallic Gold 109L - Pint Metallic Gold 109L - Pint Size Alkyd-Resin (oil base)..
1 Shot Lettering Enamel Paint Metallic Gold 109L - Quart Metallic Gold 109L - Quart Size Alkyd-Resin (oil base) gloss enamel..
1 Shot Lettering Enamel Paint Metallic Silver 193L - 1/2 Pint Metallic Silver 193L - 1/2 Pint Size ..
1 Shot Lettering Enamel Paint Metallic Silver 193L - Pint Metallic Silver 193L - Pint Size Alkyd-Resin (oil b..
1 Shot Lettering Enamel Paint Metallic Silver 193L - Quart Metallic Silver 193L - Quart Size Alkyd-Resin (oil base) gloss en..